Terma (Tib. གཏེར་མ་, Wyl. gter ma) — spiritual treasures hidden by Guru Rinpoche and Yeshe Tsogyal in the earth and in the minds of disciples to be revealed at the appropriate time by ‘treasure revealers’ or tertöns. Many of these གཏེར་, ter were collected by Jamgön Kongtrul and Jamyang Khyentse Wangpo into more than sixty volumes, the Rinchen Terdzö, or Treasury of Precious Termas. The Terma lineage, together with the Nyingma Kama, are the two modes of transmission of the teachings of the Nyingma School. Termas discovered by Chokgyur Lingpa. The golden image at the centre is a kutsab known as Ngödrup Palbar and was discovered from Tsiké Norbu Punsum. mind termas (Tib. དགོངས་གཏེར་, gong ter), discovered within the mindstream of the tertön. In the discovery of earth termas, earthly materials such as symbolic script written on yellow scroll are used to awaken the terma in the mind of the tertön. In the discovery of mind termas, no external earthly objects are relied on. In many instances of mind terma, seeing or hearing symbolic words or sounds in visions causes the discovery of the terma. 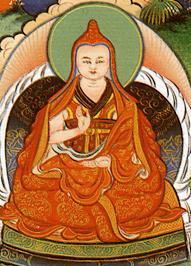 Another type of terma in the Nyingma tradition are pure vision (Tib. དག་སྣང་, dak nang) teachings. ‘Terchö’ literature can be in three parts: Lama, Dzogchen & Tukjé Chenpo (Tib. བླ་རྫོགས་ཐུགས་གསུམ་, la dzog tuk sum), i.e. sadhana cycle on Avalokiteshvara (Tib. Tukjé Chenpo). Another division is into Kagyé, Gongdü and Phurba. In a number of spiritual traditions of the world there are many instances of the discovery of teachings and objects through mystical power. Similarly, in various traditions and lineages of Buddhism, in India as well as Tibet, numerous mystical discoveries of teachings and objects have taken place. In the Nyingma school of Tibetan Buddhism, the tradition of concealment and revelation of teachings and materials of religious value through the mystical power of enlightened beings is most prevalent by far. This tradition of mystical discovery is known in Tibetan as Ter ('Treasures'), Terma ('Treasured Ones'), or Terchö ('Dharma Treasures' or 'Treasured Teachings'). While transmitting esoteric teachings to his realized disciples in Tibet, Guru Padmasambhava concealed many teachings with the blessings of his enlightened mind stream in the nature of the intrinsic awareness of the minds of his disciples through the power of “mind-mandated transmission” (Tib. གཏད་རྒྱ་, Wyl. gtad rgya); thereby the master and disciple became united as one in the teachings and realization. Here, the master has concealed the teachings and blessings, the esoteric attainments, as ter in the pure nature of the minds of his disciples through his enlightened power, and he has made aspirations that the ter may be discovered for the sake of beings when the appropriate time comes. In propagating the Buddha’s teachings amid the shamanistic society that dominated Tibet at that time, Padmasambhava saw clearly that some teachings would have to wait for a more appropriate time to take root. He concealed them until certain great practitioners…would reveal them and bring them to fruition. ↑ Tulku Thondup Rinpoche, Masters of Meditation and Miracles, edited by Harold Talbott (Boston: Shambhala, 1996). ↑ That's why translator B. Allan Wallace refers to termas as 'spiritual time-capsules'. ↑ Tulku Thondup Rinpoche, Hidden Teachings of Tibet, central pictures. ↑ Sogyal Rinpoche, Dzogchen and Padmasambhava, page 74. ↑ Tulku Thondup, Enlightened Journey: Buddhist Practice as Daily Life, pages 93-94. ↑ Chagdud Tulku, Lord of the Dance (Junction City: Padma Publishing, 1992), page 11. Andreas Doctor, Tibetan Treasure Literature: Revelation, Tradition and Accomplishment in Visionary Buddhism (Ithaca: Snow Lion, 2005). Dudjom Rinpoche, The Nyingma School of Tibetan Buddhism (Boston: Wisdom, revised edition 2002). Janet B. Gyatso, 'Drawn from the Tibetan Treasury: The gTer ma Literature' in Cabezón and Jackson, ed., Tibetan Literature: Studies in Genre (Ithaca: Snow Lion, 1996). Michael Aris, Hidden Treasures and Secret Lives, Motilal Banarsidass, 1988. Ringu Tulku, The Ri-me Philosophy of Jamgön Kongtrul the Great (Boston & London: Shambhala Publications, 2006), pages 117-121 & 159-160. Thinley Norbu, The Small Golden Key (Shambhala Publications, 1999), ‘4. Nyingmapa Kama and Terma'. Tulku Thondup, Hidden Teachings of Tibet: An Explanation of the Terma Tradition of the Nyingma School of Buddhism (London & Boston: Wisdom Publications, 1986, reprint edition 1997). This page was last edited on 6 June 2013, at 13:56.